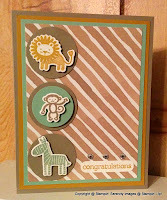 CASE Notes: I have based my card on Jennifer's layout and the use of cute animals. I wanted to make a card that would suit toddler children on their birthdays. So often there are baby cards and primary school aged cards and the 1-3 year olds get a bit missed out (at least, they do in my card making!) and that's exactly who I wanted to target with this card. Such cute cards - love the colours! Your cards are simply adorable! This is so sweet Fiona! Love your take on the card! This is such a cute card!!! My heart melted.